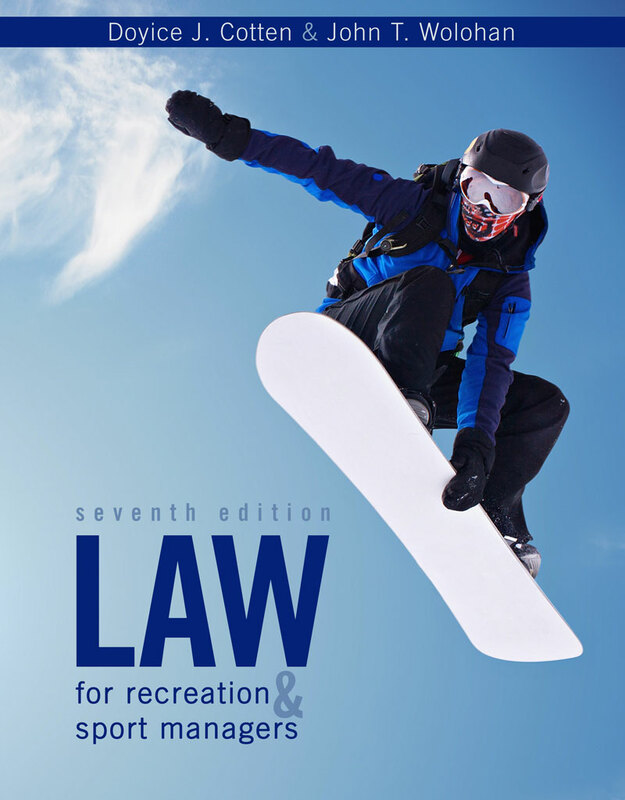 Written in non-intimidating, easy-to-read language, Law for Recreation and Sport Managers is an up-to-date source of legal information for undergraduate or graduate recreation and sport management courses and as an informative practical resource for professionals in the field. Is the only book in the field that provides in-depth study in tort law, risk management, contract law, constitutional law, and sport-related legislation. Features 57 completely updated chapters from which the instructor can choose - the most flexible recreation and sport law book in the field! Integrates an accompanying website providing students and professors with approximately 275 significant court cases. Doyice J. Cotten is an emeritus professor of sport management at Georgia Southern University where he taught graduate and undergraduate courses in sport law and risk management. He manages his own writing and risk management consulting business, Sport Risk Consulting. Dr. Cotten’s major area of interest is liability waivers. He speaks on waivers at conferences such as the Athletic Business Conference, the American College of Sports Medicine (ACSM), and the National Equine Law Conference. He also writes waivers for all types of sport and recre- ation businesses. Dr. Cotten has published more than 150 articles on legal liability and risk management. He has collected and analyzed over 1,400 sport- and recreation-related waiver cases and has co-authored two books on the subject, including Waivers & Releases of Liability (9th ed., 2016). Readers are invited to visit Dr. Cotten’s website, www.sportwaiver.com. The site features current information regarding both risk management and liability waivers and contains more than 250 articles by Dr. Cotten and many other authorities in the fields of liability waivers and risk management. Attorney John Wolohan is a professor of Sports Law in the Department of Sport Management in the David B. Falk College of Sport and Human Dynamics at Syracuse University as well as in the Syracuse College of Law at Syracuse University. Professor Wolohan, who is a member of the Massachusetts Bar Associations, received his B.A. from the University of Massachusetts-Amherst, and his J.D. from Western New England University School of Law. In addition to being the author of the “Sports Law Report” a monthly article that appears in Athletic Business, Professor Wolohan has also published numerous articles and book chapters in the areas of doping, intellectual property and antitrust issues in sport in such journals as the Marquette Sports Law Journal, Seton Hall Journal of Sports Law, Villanova Sports & Entertainment Law Journal, University of Missouri-Kansas City Law Review, Educational Law Reporter, International Sports Law Journal, Journal of the Legal Aspects of Sport and the Journal of Sport Management. Professor Wolohan has also made numerous presentations in the area of sports law to such organizations as the American Bar Association, International Sports Lawyers Association, Athletic Business, US Sport Congress, US Indoor Sports Association, the Sport and Recreation Law Association, the North American Society of Sport Management, the European Association for Sport Management and the Asser Sports Law Institute.